Psychic Kids join adult psychics in this three season cable network to learn how to use their powers effectively. The series includes a counselor, two psychics, a therapist, and a private investigator who help the children with the spirits who contact them. One such spirit was the notorious Lizzie Borden. Other shows are about non celebrated spirits that include missing person cases, demonic spirits, a spirits in limbo that are having a problem going over to the spirit side. Most of the time when a child is first visited by a dead spirit, it's confused with the child having a fantasy friend. A woman spoke about her daughter Faith having such a friend visit her with information about his name and how he died. On Psychic Kids, through investigation it was found that the girl's make believe friends really did exist. Freddie lived in the 1880s. Allison was concerned about children teasing Faith and unable to understand this special gift. In the season finale, Brad, an 18-year-old boy, who is tormented by evil spirits and dark premonitions. meets 15-year-old Santana, who sees the past through touch. Together they try to find a Florida girl who went missing without a trace. Megan is a 15-year-old girl who is fearful to share the messages from the dead she is supposed to share with her loved ones. Brittany is a 17-year-old girl who has become physically ill due to her encounters with spirits. Together they will try to face their fears in delivering messages. Olivia is a 12-year-old girl who is terrified by the dark spirits that haunt her home. Amy is an 11-year-old girl who communicates with her ancestors, yet refuses to sleep without her mom, which is causing problems in the home. Together Olivia and Amy try to face their fears and hone their psychic abilities. Alex is a 15-year-old boy who has been attacked by negative spirits, which has landed him in the hospital. Jennifer is a 17-year-old girl who is plagued by the spirits she's sees each day. Together Alex and Jennifer will try to control their abilities and use them in a positive way. Brad is an 18-year-old boy who is tormented by evil spirit and has dark premonitions that have become a reality. However, his parents are completely non-supportive of his talent. Psychic/Medium Chip Coffey introduces Brad to 15-year-old Santana who has similar abilities. Working together they try to solve the case of a missing teenage girl. In the third season premiere, Nick is a 12-year-old boy tormented by by a ghost identified as Mr. Rosenberg. Psychic/Medium Chip Coffey introduces Nick to Anissa, an 11-year-old girl who lives in constant fear and is unable to sleep alone at night because of the spirits that haunt her. Together they will work to try to banish the evil that surrounds them. Olivia and Hailey find friendship in an uncommon ability - the ability to see ghosts. Two teenage girls are haunted at night. The two teens in this episode are engulfed by fear about meeting spirits. They explore a haunted whaling ship to try to face their fears. 15-year-old girl gets help from a psychic teen to help her face the "Lady in the Mirror," a spirit who haunts her every night. Three preteens discover psychic talents they never knew they had while teaming up to try to help a woman contact her deceased father. Two teenage boys are invited to investigate an old haunted opera house. The boys are struggling to be accepted by their fathers, who doubt their psychic abilities. A mother and daughter pair of psychics teams up with teenage psychic sisters. The two teams set out to unravel the girl ghost haunting an inn from the revolutionary war. The teens in this episode use their abilities to work a missing persons case with a private investigator. 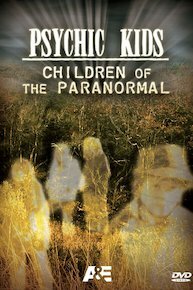 Psychic Kids: Children of the Paranormal is currently available to watch and stream on A&E. You can also buy, rent Psychic Kids: Children of the Paranormal on demand at Amazon online.